Research by Dr E. Gus Cothran of the University of Kentucky, USA, shows that early Spanish horses influenced the development of the now lost Norman horses of medieval France. Norman horses infused with Barb blood contributed to the equine type that would eventually come to be known as Percheron, after the Les Perches region of France. Both the horses of Andalusia and Normandy possessed an infusion of Barb blood from the Moorish invasions and blood typing studies by Dr.Cothran have located similar genetic markers in both breeds. The common North African ancestry of the PRE and the Percheron results in a magnificently successful fusion to produce offspring which approximate the type of the old Norman horse, prized for carrying the knights to victory centuries ago. 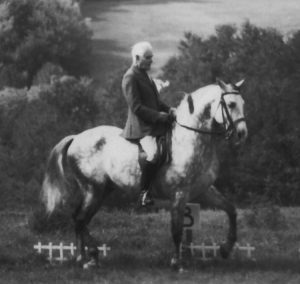 Allan and Linda Osterman Hamid of Hamid Hill Farm, Ltd., Woodbury, Connecticut founded the Spanish-Norman Horse Registry in 1991 to record the pedigrees of this unique breed. Right: Romantico HHF, son of Embajador IX, was the first Spanish-Norman Stallion bred and kept by Hamid Hill Farm; he was born 27/03/1992 out of the Percheron mare Gardenia. 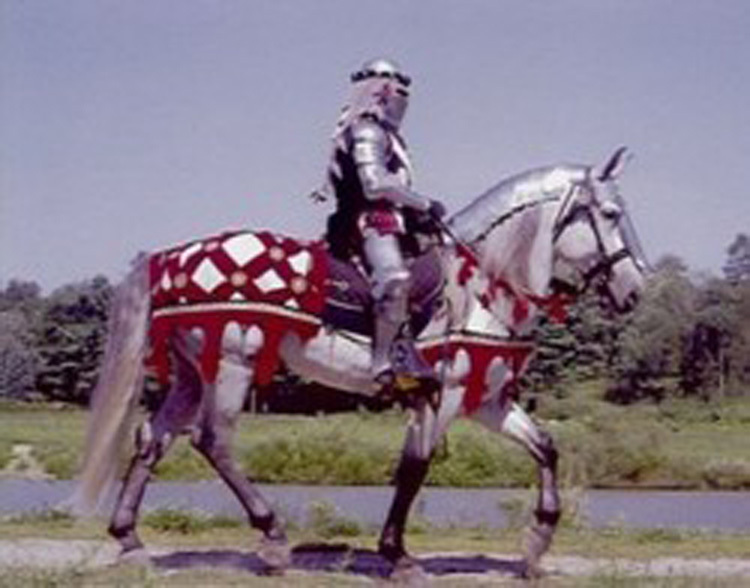 In this photo Romantico HHF is wearing authentic armour and ridden by his knight, Garry McAllister. 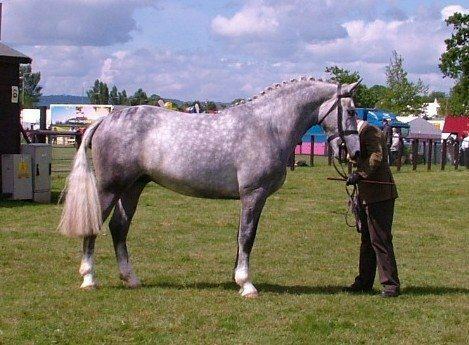 Above: Silversons Ulysses, Spanish-Norman Approved Breeding Stallion demonstrating a top quality male head. Owned by Annike & Cees Blais, Germany. Bred by Claire Lilliman. 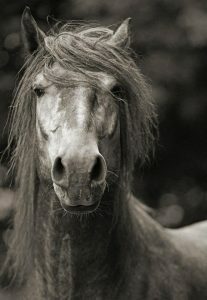 A versatile sporthorse, the Spanish-Norman physically embodies the heritage of its noble ancestors. From the regal Purebred Spanish Horse comes its elegant beauty, boldness and natural collection. 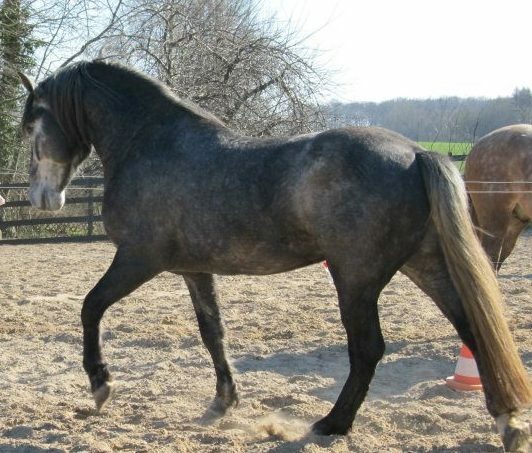 From the Percheron comes its strength, size and bone density. Endowing this breed with the unique combination of presence and docility. Head – A substantial head with depth through cheek and jaw when viewed from the side but maintaining the Spanish elegance of sculptured nasal bone and fine inverted comma-shape nostrils viewed from the front. Large expressive triangular-shape brown eyes. Ears medium size, mobile and well attached. Neck and Body – long graceful arched neck, inserted high and clean into a well defined wither and laid back shoulders that blend smoothly into a short back. Broad strong loins connect smoothly into large strong muscular hindquarters. Frontlimbs – large well developed symmetrical joints correctly aligned from side and front view. Short substantial cannon bones. Sturdy pasterns sloping at about 45 degrees. Large strong deep round hooves. Hindlimbs – powerful well developed musculature on thigh and second thigh. Large well developed symmetrical joints correctly aligned from side and rear view. Hock joint must be particularly large, strong, and well-defined with a robust achilles tendon attachment. Substantial cannon bones with clearly defined tendons. Sturdy pasterns sloping at about 45 degrees. Large strong deep round hooves. Below: Rancar Charlotte – Excellent Front-limb construction. Bred by Amanda Tomlinson. Movement – They are bred to move freely from the shoulder with elastic, fluid movement, featuring engagement and elevation with extension. Height – 15.3hh to 18.0hh, with some taller examples. Colour – Predominantly Grey, with some Bays and Blacks, but all solid colours are permitted. Minimal to zero white markings preferred. Aptitudes – Spanish-Normans have the potential to excel in a variety of equine disciplines including jumping, Eventing, dressage and driving. They perform in medieval games and historical re-enactments, are also excellent pleasure, parade, and exhibition horses. 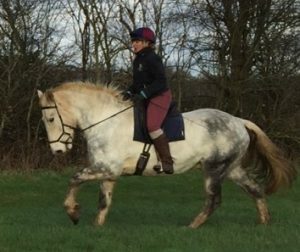 This breed is the perfect athletic heavy hunter able to carry substantial weights with ease whilst taking part in almost any equine sporting or pleasure riding activity one can choose. 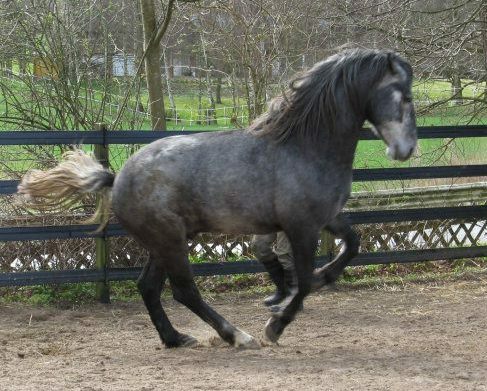 The Spanish-Norman Horse is a Purebred based upon the foundation bloodlines from Approved for Breeding PRE Stallions bred to pedigree Percheron Mares in order to re-create the Medieval Norman Warhorse. The goal of this Studbook is the development of a UK population of Spanish-Norman horses with a broad genetic background based upon 50% PRE and 50% Percheron ancestral foundation stock from different bloodlines, enabling Spanish-Norman Horses to be bred within the Spanish-Norman breed. This Spanish-Norman gene-pool may be supported and enhanced by the occasional introduction of new bloodlines via first cross Foundation generation breedings. 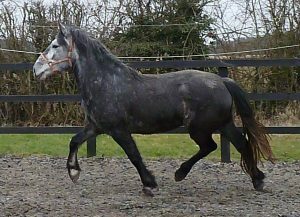 Foundation generation Spanish-Norman Horses are produced by breeding an Approved for Breeding PRE Stallion to a registered pedigree Percheron mare, resulting in horses with 50/50 bloodline combination. 1. Breed two Foundation generation Spanish-Norman Horses together; the Stallion must be Approved for Breeding. This is the ideal combination of parents. 2. Breed a Foundation generation Spanish-Norman Mare to a PRE Stallion resulting in a foal with 75% PRE blood. Third generation Spanish-Norman Horses MUST carry a minimum of 50% PRE blood (Apto PRE only). There are 2 acceptable breeding strategies leading from the 2 strategies for Second generation horses. The Spanish-Norman Horse must remain within the range of 50% PRE to 75% PRE blood but the preferred and most typical representatives of the Spanish-Norman Horse are those with the 50/50 balance of original foundation bloodlines. Breeders should calculate the PRE blood % of each planned foal before covering takes place, and they are encouraged to contact BAPSH Ltd for assistance if required. 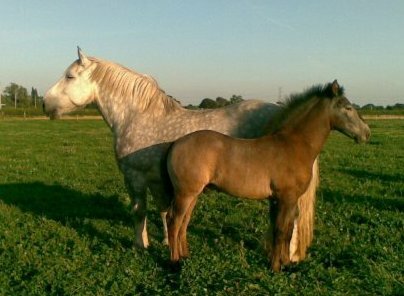 iii) the Foal must be at Foot with its mother. See ‘FOAL REGISTRATION PROCEDURE’ lower down the page for forms and details. All Spanish-Norman horses which are registered with the Spanish-Norman Horse Registry, USA, will be accepted into the BAPSH Ltd Spanish-Norman Main Studbook when their Registration application with BAPSH Ltd is completed. When IMPORTING A HORSE FROM THE EU OR OTHER COUNTRY – THE IMPORTED HORSE MUST BE REGISTERED WITH THE UK PIO FOR THAT BREED OR TYPE WITHIN 30 DAYS OF ARRIVAL IN THE UK. Equines of another Purebred breed cannot be admitted directly into the Spanish-Norman Horse Studbook, but breeders may continue to introduce new blood into their breeding program via first cross products between Approved for Breeding PRE Stallions and Percheron Mares which are registered with their respective recognised Studbook. The Studbook is not open to any other breed. 3a. Incorrect procedures with Covering Certificate or Foal is not at foot with dam, but Foal has No DNA Type and parentage test. 3b. Genetic Tests for inheritable defects are not completed. i) The PRE parent or Grandparent lacking Breeding Approval, is Approved for Breeding by the ANCCE-LGPRE. 2) The Spanish-Norman Horse Sire is Approved for Breeding. 3) The Appendix horse has a full DNA Type and Parentage compatibility test completed and the Certificate sent to the BAPSH (in cases where the Covering Certificate/foal at Foot criteria were not met with). ALL Changes MUST be Registered with BAPSH Ltd within 30DAYS of the Date of Change. BAPSH will register the new information in the Studbook and the DEFRA Central Equine Database, and Update the Horse Passport/s and return it/them to the Owner by Signed For Delivery. 1.NEW Owner – THE CHANGE OF OWNERSHIP MUST BE REGISTERED WITH BAPSH Ltd WITHIN 30 DAYS OF THE PURCHASE DATE. When you are Buying OR Selling a Horse – The SELLER must complete, SIGN & date a BAPSH Ltd TRANSFER OF OWNERSHIP Application Form showing the date of sale, the purchaser’s name, address & other contact details clearly; the BUYER must SIGN & date the Buyer section. Send the Horse’s PASSPORT, the Transfer Application Form, & Fee to the BAPSH Ltd Registrar within 30 days of the Sale. BAPSH recommends that the Seller sends the Transfer of Ownership & Passport to BAPSH as soon as the sale is completed and BEFORE the horse travels to its new home, so that the horse is registered in the New Ownership when it leaves the Seller’s property. 2.Change of Address or Other Contact Details – NEW ADDRESS or CONTACT DETAILS MUST BE REGISTERED WITH BAPSH Ltd WITHIN 30 DAYS OF THE HOUSE MOVE. Download the CHANGE OF ADDRESS Form , complete the form and send it with your Horse Passports that are registered with BAPSH Ltd to the Registry Office with the appropriate fees within 30 days of your change of address. 3. Change of Surname – NEW SURNAME DETAILS MUST BE REGISTERED WITH BAPSH Ltd WITHIN 30 DAYS OF THE NAME CHANGE. Download the CHANGE OF SURNAME Form , complete the form and make a COPY of your MARRIAGE or DIVORCE Certificate or Other Legal Certificate of Name Change. Send both these Documents with your Horse Passports that are registered with BAPSH Ltd to the Registry Office with the appropriate fees within 30 days of your Change of Name. 4.Death of Owner – The death of the Owner of a BAPSH registered horse should be notified by letter or email to BAPSH Ltd as soon as possible after the event, and WITHIN 30 DAYS. Thereafter, BAPSH should be informed of the Estate Executor’s Name and Contact Details and be sent a copy of the part of the Horse Owner’s Will which determines the disposition of the Horse/s plus any other relevant information about the proposed actions in relation to the Horse/s. 1. Castration/Gelding – DATE & PLACE OF GELDING MUST BE CERTIFIED BY THE VET & THE CHANGE OF STATE REGISTERED WITH BAPSH Ltd WITHIN 30 DAYS OF THE OPERATION. Download the GELDING CERTIFICATION Form and complete the horse’s details then get the Vet that performed the Operation to SIGN & date the form and STAMP it with the Vet Practice Stamp. Send the completed form, the Horse’s Passport, and the fee to BAPSH Ltd Registry Office within 30 days of the Operation. 2.Death of Horse – THE DEATH OF A HORSE MUST BE REPORTED TO THE UK PIO FOR THAT HORSE AND THE PASSPORT RETURNED TO THAT PIO FOR CANCELLATION WITHIN 30 DAYS OF THE HORSE’S DEATH. Download the DEATH NOTIFICATION Form and send the completed form with the Horse’s Passport (PREs, Register II Breeds, Hispano-arabs, & Register V Breeds) to the BAPSH Ltd Office for cancellation within 30 days of death. The information update & passport cancellation will be free of charge. Owners may request the passport’s return if they pay the Fee to cover the extra cancellation work required and the cost of postage and packing. 3.Export of Horse – It is a Legal Requirement to keep accurate records of the Horses living in the UK. When a Horse is Exported from the UK it is essential that the BAPSH Studbook is informed within 10 days of the Horse’s departure so that the Studbook and the DEFRA CED can be Updated accordingly. Download the EXPORT NOTIFICATION Form and send the completed form with a Copy of the Intra-Trade Certificate or Equivalent Travel Document to BAPSH Ltd as soon as the Horse has actually left the UK. 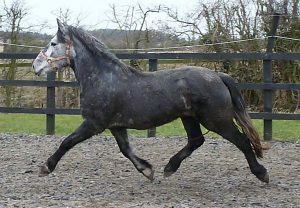 4.Change of Colour/ Markings/Scars – Some Horses have their Coat Colour misidentified by the Vet at their original Foal Identification, especially horses that go Grey very slowly, other Horses have White Markings that expand or shrink over time or they acquire Scars that were not on the original ID sheet. If this is the situation for your horse then you must get the Horse’s Passport and Studbook records Updated. Download the HORSE DESCRIPTION UPDATE Form and send the completed form with the Horse’s Passport to BAPSH Ltd for the changes to be officially added to the Passport, to the Studbook Records, and to the DEFRA CED. Above: Silversons Ulysses, Spanish-Norman Approved Breeding Stallion striding out to impress. Stallions must be registered with BAPSH Ltd in the Main Studbook, DNA Typed and parentage confirmed. They must be over 3yrs old and have been assessed by the Breeding Evaluation Team and awarded 5/10 or higher. (see paragraph on Breeding Evaluation below for details). Spanish-Norman Mares may be assessed in the same manner as the Stallions; breeders and mare owners are recommended to undertake the assessment which provides valuable information for the breed and breeding programmes. At present there is no barr upon breeding from Spanish-Norman mares which have not been assessed, but it is recommended. All PRE Sires must be Approved for Breeding at the Basic level by the ANCCE-LGPRE. All Percheron Mares must be over 3 yrs old, and be correctly registered with the British Percheron Horse Society, Société Hippique Percheronne de France, the Percheron Association of America, or the Canadian Percheron Association. Aside from the above requirements, the Breeder is responsible for the choice of breeding animals according to their breeding program. 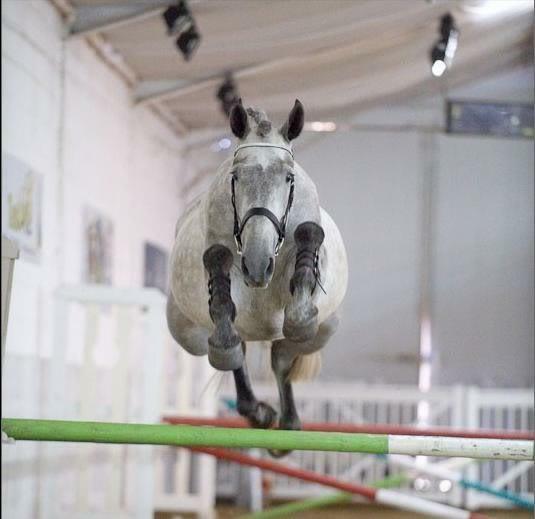 Above: Silversons Ulysses, Spanish-Norman Approved Breeding Stallion, showing his natural agility and hindquarter engagement. Artificial insemination fresh, chilled and frozen is permitted. Covering Certificates are issued as normal by the BAPSH Ltd upon receipt of a request from the Stallion owner. All Stallions must be over 3yrs old before being collected for AI. Embryo Transfer is permitted using large cob or draft-horse mares or similar types of mare of good temperament as the host/s to ensure transmission of good temperament to the foals. Spanish-Norman mares may have more than one foal registered from them each year via the use of host mares. All Mares must be over 3 yrs old before being put in foal. Covering Certificates for PRE Stallions and Spanish-Norman Stallions can be obtained from the BAPSH Registry Office. 1.The Covering Certificate should be issued after the mare is covered , and a copy sent to the BAPSH Registry Office within a month of the last covering. 2. 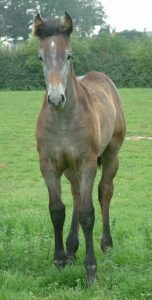 The foal should be registered with BAPSH Ltd whilst it is at foot with its Dam and BEFORE 5 months old. If either of these requirements is NOT met then the Foals MUST DNA typed and parentage tested at the time of registration. Breeder/Owner downloads the BAPSH Ltd Register II Section 4 Foal Registration Application Form or requests a copy from the BAPSH Ltd Registry Office. The Owner completes the Breeder/Owner details in full, selects the ‘Human Food Chain Status’ for the foal, completes the pedigree. The Foal Registration form and DNA sample are sent to BAPSH Ltd with copies of the Parents Registration documents with 4 generation pedigree, & copies of parents’ passports, and the Mare Owner’s Section of the Covering Certificate, plus the appropriate fee to include the fee for the following DNA test where required. a) If the Covering Certificate and Registration application time-frames were not adhered to the Foal must be DNA Typed and parentage tested. Hair samples that are not used are stored securely in that horse’s own dossier. When BAPSH receives the required certificate from Animal Genetics, the Foal Registration is completed, the UELN allocated and the Passport printed. 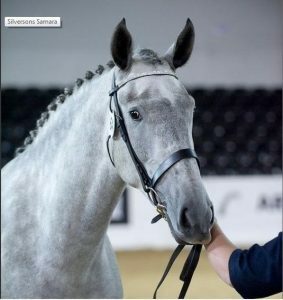 Stallions – Breeding Evaluation is compulsory for Stallions over 3yrs old registered in the Spanish-Norman Horse Main Studbook before they may be used to cover mares. Mares over 3yrs old may also be Evaluated for Breeding Approval; at present this is optional. i) Physical inspection by an approved Veterinarian to determine the presence or absence of inheritable defects including the mouth, eyes, throat, limbs, and hernias (genitalia, inguinal, scrotal). ii) Movement at walk, trot & reverse to determine freedom from Locking Patella, Stringhalt, and Wobbler disease, and lameness. iii) Conformation & Type – 27 conformation measurements are taken, and the horse is assessed for overall type and conformation in relation to the Breed Standard. 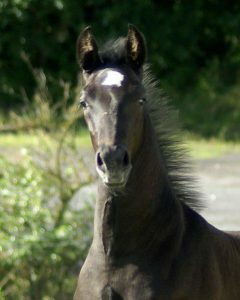 A young PRE mare demonstrating the calm confident attitude required for the measurement stage of the Evaluation process in all breeds managed by BAPSH Ltd. Photos show ‘Height at Withers’, ‘Length of Forearm’, and ‘Length of Stifle’ being measured. 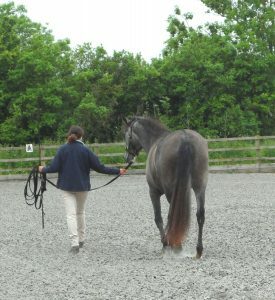 Below the same mare is Walking out in-hand in a good active manner for Movement assessment. iv) Movement and athleticism for Riding and Sport. 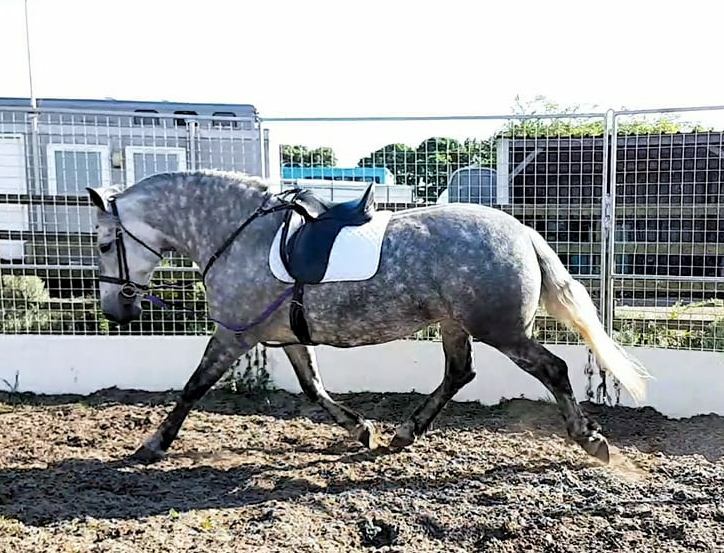 Walk is assessed in-hand, and trot and canter are assessed in Freedom; then the horse is assessed loose over a series of jumps down a short jumping lane. v) The horse’s temperament, behaviour and overall attitude is assessed throughout the Evaluation. Horses should score 5/10 for all parts of the Assessment to be Approved for Breeding. Bronze Award. Horses with an average score of 7/10 across the assessment are recognised with the Silver Award. Horses with an average score of 8/10 or above across the assessment are recognised with the Gold Award. All the data is recorded on the BAPSH Studbook for each horse. The information gathered is used to monitor the development of the breed and to assist breeders to make informed choices when planning their breeding programmes. Above: Silversons Samara – 3yr old mare competing in the Show Jumping section of the 2009 BEF Futurity at Arena UK. Sired by Damasco VII ex Obole du Bocage. Bred by Claire Lilliman. Horses (mares, stallions, and geldings) that compete in Dressage, Show Jumping, Eventing, Driving, and Endurance at the higher Affiliated levels can gain points for achieving specific scores or %. The number of points required to achieve the ‘Sport’ designation is dependent upon the Sport; points must be achieved across a minimum of 5 shows/competitions in a particular sport over a 12 month period. The Owner of the horse must submit documentation to the BAPSH at the end of the 12 month period to prove the achievements. The horse is then awarded the title of Sport-Drs, Sport-SJ, Sport-Ev, Sport-En, or Sport-Drv, or any combination of these titles. This information is added to the horse’s online web information and pedigree which should be live online by early March 2019. Applications from owners for BAPSH to recognise, retrospectively, Sports points achieved in previous years before this Performance Award Scheme was initiated will be considered on a horse by horse basis providing the documentation provided is solid. Mares or Stallions who have four progeny (mares, stallions, and geldings) who all achieve a Sports Performance Award are given the title PREFERENT. This is shown on their online records and pedigree and assists breeders in designing their breeding programmes. More detailed information about the various points available at particular levels in each Equine Sport will be available soon.